We worked together with the former Danish Ministry of the Environment in 2014 to show what the future waste strategy for the nation could look like, in order to aid policy making decisions. Waste is an increasingly urgent problem as most Western countries have adopted a throwaway culture. Municipalities charged with tackling this issue are faced with challenges because policy choices are usually long-term and require some degree of cultural and technological foresight. Anticipating the results of policy can also be extremely challenging. Vision guides and scenario-based forecasting can be an extremely strong communication tool for policy makers to understand the context of their decisions, ensure their ambition is at the right level, and communicate their thinking to citizens. We utilised these tools to provide a vision of the not-so-distant future where waste is no longer the last step in a product’s lifecycle but a new beginning. It shows how a waste-free Denmark is not only a more sustainable place, but also how this route can create new and attractive opportunities. 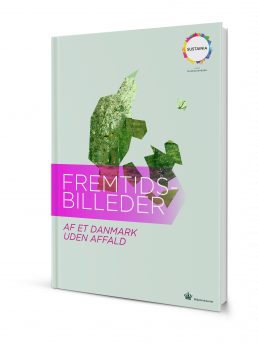 The publication showcases a range of suggestions on how Danish people can be less wasteful in their everyday life. In creating the publication, we analysed trends and interviewed experts to gain an insight into possible solutions and the benefits of waste prevention and recycling. From the analysis, we selected the range of suggestions based on the possibility of implementing already existing solutions that are currently only being used at a niche level but have a capacity for a wider reach. The Ministry of Environment and Food of Denmark is responsible for administrative and research tasks in the areas of environmental protection, farming and food production.